If anyone should suffer from the imposter syndrome, it should be me. But I don’t (See  for a description of my undergraduate years). In my early years in the profession I was certainly intimidated by the academic pedigree and background of those around me, their ability to quickly understand the concepts, their powers of deduction and their intuition into mathematics. But intimidation does not mean that I don’t belong. Belonging was and continues to be an active and aggressive decision on my part. My first mathematical experience outside of Arizona was as a summer intern at Bell Laboratories in Murray Hill, NJ. Everyone around me was white, with degrees from the best institutions, and connections to the best mathematicians in the world. What affected me most over that summer was the lack of personal contact between individuals. I felt invisible. In , I described my reaction to being there, but in spite of my alienation, I worked hard and produced a paper during my time there . 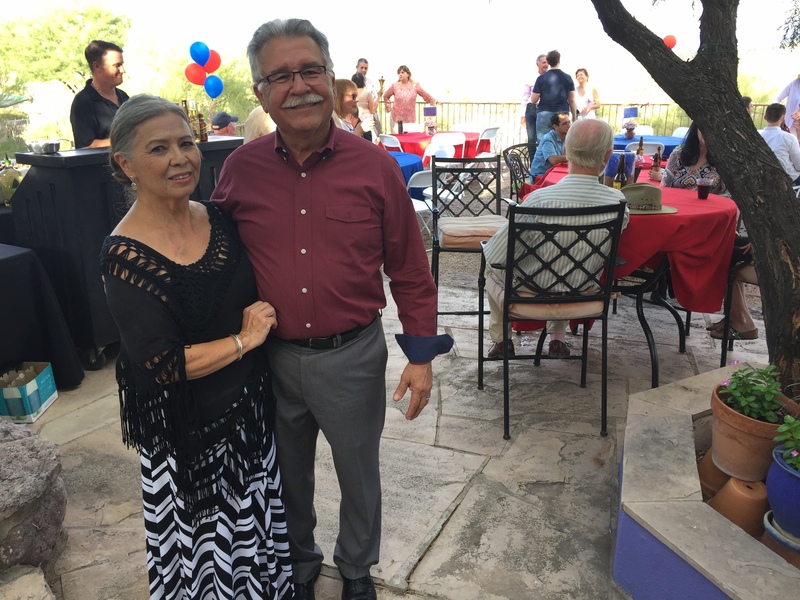 William Yslas Vélez celebrating his retirement! More than the academic pedigree though is the sheer brilliance of the mathematical community. I chose number theory as my area of research. Over the years I have listened to amazing talks, speakers showing tremendous insights and cleverness. I am so fortunate to have the background to have been able to appreciate the ideas presented. Twice, not once but twice, I have struggled with an idea for months and Hendrick Lenstra resolved the problems overnight, and I mean literally overnight. In the first instance , I had proved that the smallest order of an element in a coset in a finite abelian group actually divided the orders of all elements in that coset and wondered if the result could be more general. A couple of years passed and the problem was brought up at the Berkeley Problem Solving Group. Lenstra provided a counter example the next day [4, 5]. In mathematics, we are fortunate to be surrounded by brilliance. And this raises the question: Do we belong? Almost any student, at one point or another, will realize that they are not the best student in the class. In fact, for most of us, this will occur in our first college mathematics class. If our goal in life is to be better than anyone around us, life will be a disappointment and a mathematical career will be difficult and disappointing. Part of being a mathematician is submitting an argument in favor of an idea. This submission may encounter criticism, the argument may be incorrect or others may find a shorter more elegant route to the result. This criticism may be difficult for some to take, but it is an integral part of our profession. I, like probably all of us, have received referee’s report that combine correct criticism with cutting remarks (like this one that I received early in my career: The author leaves me with the impression that he is not aware of any progress in mathematics in the 20th century). In my role as advisor to the math club, I would inform the student leaders that the club should not be a showcase for their mathematical skills. So often, these bright students wanted to show off and this discouraged others from participating. Intimidating others with your abilities is a poor foundation for life. As faculty we can be intimidating to students. We understand the material that we teach very well and we can appear to be so much brighter than the students. But we are not brighter, we are just more knowledgeable and have been blessed with mathematical ability. And I do mean blessed. I think that most students could pass our calculus courses if they had enough dedication and worked hard. Obtaining a doctorate in mathematics is very special. It takes a love of the subject, an increased ability for abstraction and a willingness to spend years in contemplative study. These are special blessings and we should use our blessings to better the lives of the students that we encounter. Let’s think about what is occurring in a mathematics classroom. We introduce some of the most beautiful and important ideas imaginable, ideas that have changed the way we look at life. A mathematics classroom is like an art appreciation class, but much better. In an art class students are given explanations as to why the art is important, how it fits into history, and why it differed from its predecessors. As much as a student might enjoy a painting by Rembrandt, this enjoyment will not help most students create a comparable painting. In mathematics we are introducing mathematical creations comparable to the best art, but we should be providing the students with the ability to create that art for themselves, to arrange that information in their own mind, to connect the new ideas to the established knowledge that students already have. With time, dedication, and practice students become active artists in the creation of new mathematical knowledge. The artistry starts small—solving homework problems. If a student finds pleasure and joy in finding a solution, in understanding a new concept, then this emotion is a sign of belonging to the mathematical community. Emotions are not fake and this joy provides the evidence that the student is not an imposter. When faculty have those same emotions in research or teaching or scholarly endeavors, this is proof, proof of not being an imposter. As an undergraduate I never saw the excitement for their subject in my instructors. In fact, most of them looked bored as they taught their classes. Mathematics classes are so often depicted as the instructor droning on. This is especially true of entry level classes. The purpose of an entry level course should be to motivate the student to take the next mathematics course, and not just to satisfy a requirement . Is it possible to re-envision the mathematics classroom? Can we look at mentoring students differently? Our goal should be to bestow on them the wonderful gift that allows for creative expression. It is this gift that allows me to say that I belong to this mathematical community. Though my own mathematical creations are small compared to so many mathematicians, my joy in having been able to resolve some problems is HUGE. I remember going to my thesis advisor’s office with an important insight into the problem that I was working on and he said, “No that can’t be because the root of unity, because it is not, because. Oh, I see!” In a presentation that I gave at a Western Number Theory Conference as a graduate student, I turned around to see Julia Robinson , with a smile of appreciation as she understood my proof. This is what we are giving to students, this ability to be artists, to create information for themselves based on the cumulative knowledge of our community. And this cumulative knowledge has been created, reformulated, and repackaged by all of us. This is what I think belonging is: to participate in the mathematical enterprise and to have moments of joy in this participation. If students are given the opportunity to create mathematics and find enjoyment in that process, then they are not imposters. They are our colleagues. I suspect that many students, and also faculty, say they suffer from the Imposter Syndrome. This syndrome is based on outside measures, and not on our inner-life. I recall a statement that appeared on a slide from a presentation by Rochelle Gutierrez, “People need mathematics, but mathematics needs people.” The mathematical enterprise needs all of us, our ideas, our enthusiasm and our emotions. Some Remarks on a Number Theoretic Problem of Graham, W. Y. Vélez, Acta Arithmetica, XXXII, 1977, pp. 233-238. On a property of cosets in a finite group, W. Y. Vélez, Journal of Algebra 115, No. 2, 1988, pp. 412-413. Some results on radical extensions, F. Barrera Mora and W. Y. Vélez, Journal of Algebra, Vol. 162, No. 2, 1993, pp. 295-301. Mathematics Instruction, An Enthusiastic Activity, William Yslas Vélez, On Teaching and Learning Mathematics, AMS Blogs, August 1, 2014.